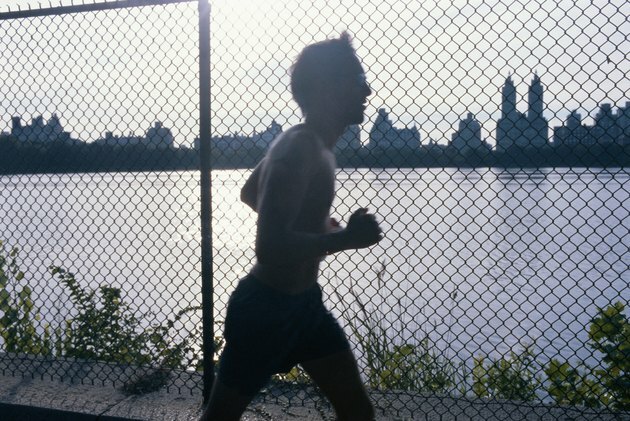 What Are the Health Benefits of Running 2 Miles a Day? The benefits of exercise have been widely studied. From weight loss to improved memory, getting your body moving daily can bring fantastic results. Running is an effective form of cardiovascular exercise that has all the benefits of other types of exercise. Running two miles a day is enough to reap the rewards of cardiovascular exercise, without any of the drawbacks of too much running. Running is an excellent way to lose fat or maintain your current healthy body fat percentage. It's a pretty demanding activity and so it burns a lot of calories -- typically about 100 calories every 10 minutes, depending on your weight and how fast you run. Running two miles a day will help you burn about 200 calories, which can help you lose a pound of fat in a little over two weeks if your diet remains consistent. Combining 2-mile daily runs with a reduced-calorie diet can help you lose weight even faster. Running is a weight-bearing exercise. Your body has to work against gravity to propel you forward. To adapt to the challenge, your bones and muscles get stronger. More muscle mass improves your quality of life, increases your metabolism and can even help you beat illness, according to an article published in The American Journal of Clinical Nutrition. Building bone strength helps counteract the natural bone loss that occurs after age 35. It also helps protect you against osteoporosis and arthritis. A study published in Journal of the American College of Cardiology found that running even 5 or 10 minutes a day significantly lowered the risk of death from cardiovascular disease and all other causes in 55,137 adults, 18 to 100 years of age over a period of 15 years. In another study, published in American Journal of Epidemiology, researchers found that joggers lived longer than non-joggers over a 35-year-period of study. On average, female joggers lived 5.6 years longer than female non-joggers, and male joggers lived 6.2 years longer than male non-joggers. The mental health benefits of exercise have been well-documented in scientific studies. From relieving depression to improving memory skills, getting your heart rate up each day can have lasting effects on the way you feel and see the world. Running is no exception. You've probably heard of "runner's high." It's that feeling of elation runners get on the trail, track or treadmill due to endorphins released in the brain during exercise. Running 2 miles a day can help lift your mood and give you a more positive outlook on life. Doing something good for yourself each day, like taking time out for a run, can make you feel more accomplished and increase feelings of self-worth. Setting and achieving small goals, such as running two miles in under 20 minutes can reinforce your ability to achieve what you set out to do. ACSM's Health & Fitness Journal: Is Exercise a Viable Treatment for Depression? Does Running One Mile a Day Help Lose Weight in the Thighs?